Fill a 12- inch skillet with water to a depth of 1-inch and bring to a boil. Meanwhile, lay lime leaves, 2 per seafood portion, onto a metal or bamboo steamer basket. Slice orange in half crosswise. Squeeze juice from one orange half to make 1/4 cup juice; cut remaining half into thin slices. Layer orange slices on top of lime leaves. 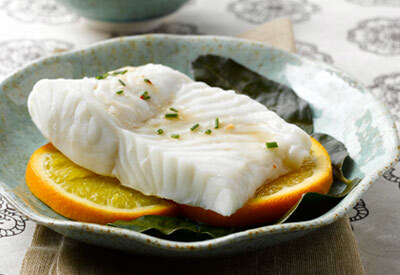 Rinse any ice glaze from frozen Alaska Halibut under cold water; place fillets on top of orange slices in steamer and season with salt and pepper. Turn off heat. Place steamer basket into skillet; return liquid to a boil. Cover loosely and cook 5 to 7 minutes for frozen halibut or 4 to 5 minutes for fresh/thawed fish. Cook just until fish is opaque throughout. While halibut is cooking, blend orange juice, ponzu sauce, chopped chives, and red pepper in a small bowl. Serve sauce with cooked fillets. Cook's Tip: Best with Alaska Whitefish Varieties: Alaska Pollock, Cod, Sole or Halibut. For a more elegant presentation, steam in parchment packets. *Kaffir Lime Leaves: A glossy, dark green, fragrant leaf grown in Southeast Asia and often used to add citrusy flavor to many regional curries and soups. The leaves can be used fresh, dried or dried and crushed. **Ponzu Sauce: A citrus based sauce with a sweet, sour and slightly salty flavor used in Japanese cuisine and as a dipping sauce.